Send her everything she needs to enjoy a luxurious spa experience in the privacy of her own home. With this gift of simple serenity, she can soak the day away and lavish in our line of relaxing Vanilla scented spa products at her leisure. Each gift is hand crafted, shrink wrapped, tied with a bow for presentation and ready for gift giving. The Spa products featured in this gift are part of the luxurious Art de’ Moi Spa Line, manufactured and distributed exclusively by Art of Appreciation Gift Baskets. Gift Basket with Fabric Liner. 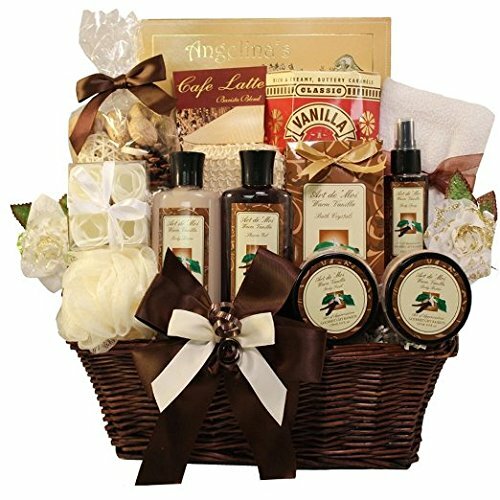 An original gift arrangement by Art of Appreciation Gift Baskets™. Each gift is hand crafted and assembled in the USA, US Trademark #4371601. NOTE: Some components may be imported.